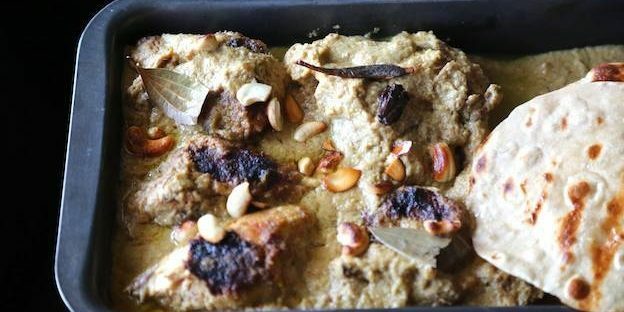 I love this curried chicken because it’s so easy to make, you blitz everything in a food processor, marinate and then bake the chicken. 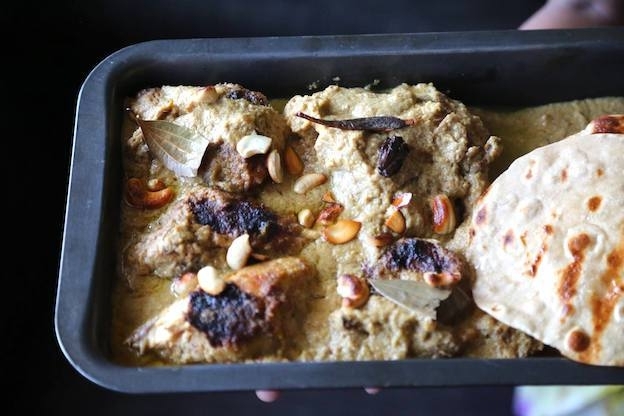 It kind of imitates the flavour of a korma without all the effort. Use dried jardaloo (Indian apricots) or the Turkish ones. Turkish apricots come pitted and save you some effort and time but Jardaloo is a more complex and delicious flavour. 1. If using dried apricots, soak them in hot water for 20 minutes and pit them if they are Indian apricots. 2. Reserve the kernel if you wish to use the nuts inside. This step is optional. Break the kernels using a pestle or a small hammer and reserve the small nuts inside. Discard all broken shells. If you are using fresh apricots, test taste the nuts. The nut of fresh apricots can sometimes be bitter. 3. Puree all the remaining ingredients from 2-11 to a smooth paste. Season with salt and if the apricots and yoghurt taste sour and a little sugar. The flavour should be tangy and a little bit spicy. If your fresh apricots were sour you may need more sugar. Adjust spiciness by adding more red chilli powder. 4. Pour this mixture over the chicken. Add the whole bay leaf, black cardamom and cinnamon pieces and marinade for 3-4 hours or overnight. 5. Preheat oven to 300 F. Place chicken skin side up in a medium oven proof dish about 12 inches by 8 so the chicken fits snugly. Pour remaining marinade over the chicken. 6. Cover dish with foil. Prick foil in a couple of places with a fork to help release steam and bake for one hour. 7. Raise oven temperature to 375 F. Remove foil and continue to bake until chicken is golden brown and cooked through and the sauce is bubbly and thick. 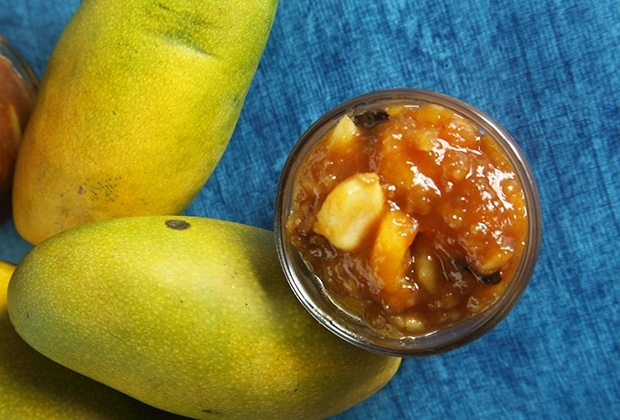 Garnish with the apricot nuts and or toasted cashew pieces. 8. Serve hot with flat breads like naan, roti or parathas. If you cannot find plums Indian plums (genus prunus) are smalL, dark and often confused with a local fruit, jamun, also called Malabar or Java Plum. Plums came to India 4,000 years ago from China. While they are now a commercially important crop in China, in India they are grown as quickly flowering fillers for mangoes and litchi. Cultivated mostly in the temperate zones of north India and all over Punjab, India is the 9th largest producer of plums like the Satlej purple, Kala Amritsari, Triton and Alu Bukhara, the latter is also a generic term used to describe dried plums or prunes. City markets only get plum varieties unsuitable for drying. Chinese 5 Spice is a classic staple of the Chinese kitchen. You can buy it anywhere, but it’s also easy and fun to make at home since an Indian kitchen has most of these spices anyway. This mix traditionally contains Schezuan peppercorns, which I substitute with its close cousin teppal or trifal, used in Konkan fish curries.Plums can range from sweet to very sour. Taste your marinade and adjust sweetness before you bake the chicken. 1. Toast all the spices for the Chinese 5 Spice in a dry skillet on medium heat about 2 minutes. Cool and grind to a fine powder. 2. Puree 6 plums with the Chinese 5 Spice, ginger, garlic, soy, sesame oil, orange juice, zest and red chilli paste or sauce. Stir in a teaspoon of salt and sesame seeds. Taste the marinade for salt, sweetness and spice levels. Adjust. 3. Toss chicken, quartered onions and remaining plum halves in this sauce, cover and let sit in the refrigerator for 3 hours or overnight. 4. Preheat oven to 350 degree F. Lightly grease a baking tray. Place the marinated chicken skin side up, onions and plums in the tray and spread about. Cover with foil, prick the top of foil with a fork and bake 30 minutes. Remove foil, raise heat to 375F and contine to bake another 25-35 minutes until chicken skin is golden brown, partially blistered and fully cooked. Stir in the bokchoy leaves and stems. They will wilted in the heat of the casserole. Garnish with green herbs of your choice, a raw plum to add color if you wish. 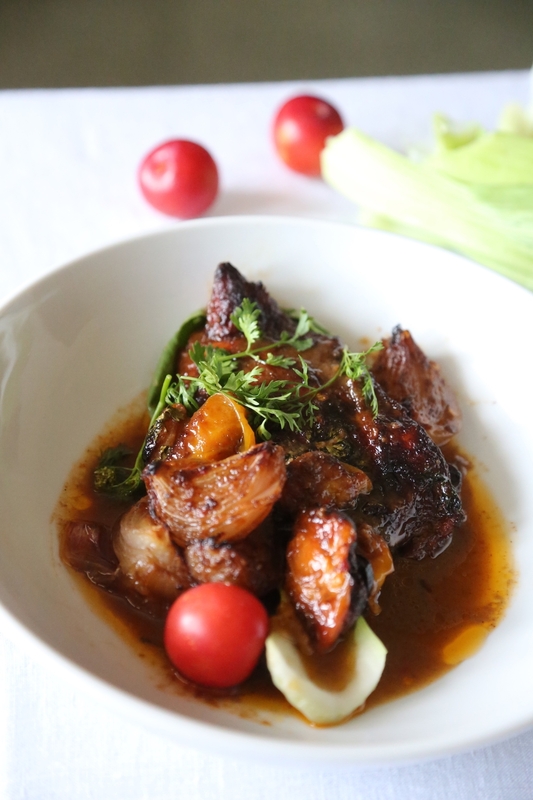 Rassa is means 'jus' and refers to a dish with a soupy gravy generally. It differs from a Patal gravy in that it is thickened with a small amount of coconut or rice flower. 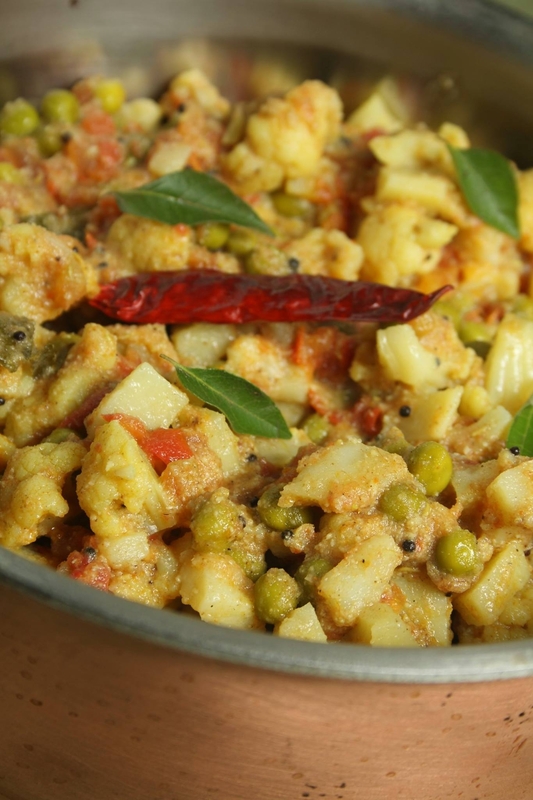 This is a traditional recipe from the western coast of India. Heat 3 tablespoon of oil in a small kadai or saucepan on high heat and fry ½ tsp mustard, curry leaves & little hing until they sizzle and rise to the surface. Lower flame to medium and add the potatoes and chopped tomatoes and a 1/2 cup of water and cook until potatoes are almost done. Add remaining vegetables and the wet masala and cook until tender. Remove from fire season with salt to taste and garnish with chopped cilantro and juice of ½ fresh lime. MUSKMELON IS A FAMILY OF MELONS THAT INCLUDE MANY VARIETIES LIKE CANTALOUPE, KOREAN,HONEYDEW,CANARY AND SUGAR MELON. THEY ALL BELONG TO THE GENUS CUCUMIS UNLIKE WATERMELON AND ASH GOURD OR WINTER MELON THAT COME FROM A DIFFERENT STRAIN. CHINA IS THE LARGEST PRODUCER OF MELONS. IN INDIA THEY ARE IN SEASON APRIL TO JULY. CANTALOUPE IS A GOOD SOURCE OF VITAMIN A AND C AND IS 90% WATER. 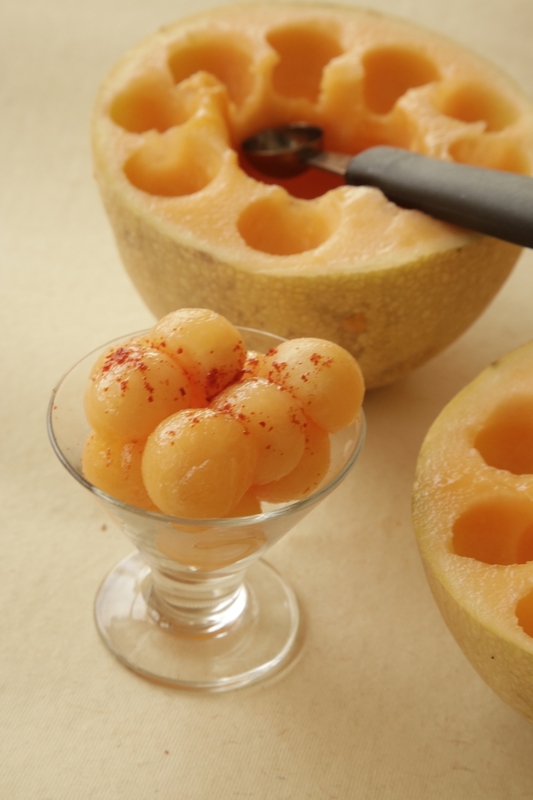 I LIKE TO SERVE MUSKMELON CHILLED AS AN APPETIZER BUT ITS ALSO GOOD AS A SALAD, PALATE CLEANSER AND DESSERT ON A HOT SUMMER DAY. 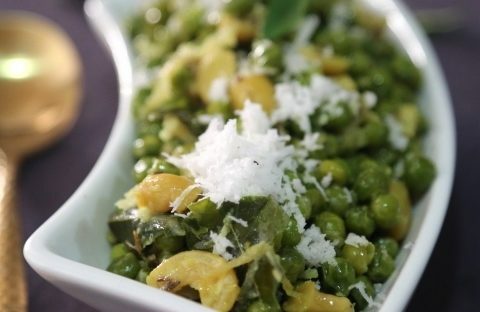 IN AN INDIAN SENSE OF SALAD YOU WILL FIND A RECIPE FOR MELON DILLON KA WITH SAFFRON OIL. USING THE BALLING TOOL SCOOP OUT ROUND BALLS FROM THE MELONS FLESH AND PLACE THEM IN SMALL 4 OZ SERVING CUPS. PILE THEM UP ONE OVER THE OTHER. KEEP COVERED AND CHILLED IN THE FRIDGE UNTIL YOU ARE READY TO SERVE THEM FOR UPTO 4 HOURS. SERVE COLD WITH CRUSHED SALT, WEDGES OF LIME AND GROUND PAPRIKA ON THE SIDE FOR PEOPLE TO HELP THEMSELVES. THIS SEASONING SHOULD ONLY GO ON WHEN YOU ARE READY TO SERVE THE MELON BECAUSE SALT LEACHES WATER AND THE MELONS WILL LOOSE THEIR FIRMNESS IF SALTED IN ADVANCE. 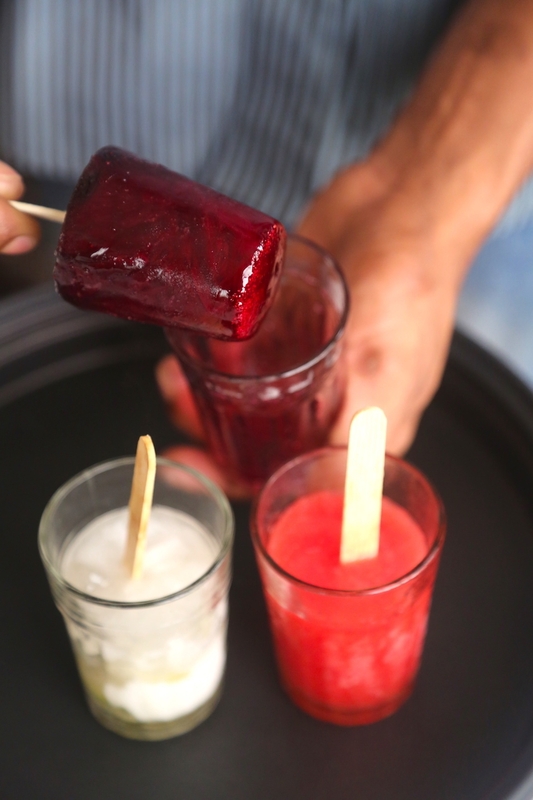 Beat the heat with Chaisicles- popsicles made from fresh fruit juice in chai glasses. Blueberry and black tea, watermelon, lychee and lime flavours. You could try almost any fresh fruit juice. 5 cups of your choice of fresh fruit juice such as watermelon, orange, pineapple or flavoured iced tea such as mint or black tea. You can also use lemonade or limeade. Pour the juice or steeped into Chai glasses, add the fruit and stir. Stick them in the freezer until soft ice forms between 1-3 hours depending on you climate- it takes longer in hot weather. Press a candy stick in the middle of the semi formed ice and return to freezer until it solidifies. To unmold rub the glass with both hands to loosen popsicle. Give the candy stick a twist and a tug. Enjoy!! For adults only you could add a dash of booze. Charlotte Russe adapted from a recipe in an 1886 edition of Mrs. Lincoln's Boston Cookbook. The first edition was published in 1884. Mrs. Lincoln's Boston Cook Book is possibly the earliest American cookbook to print a recipe for Charlotte Russe. 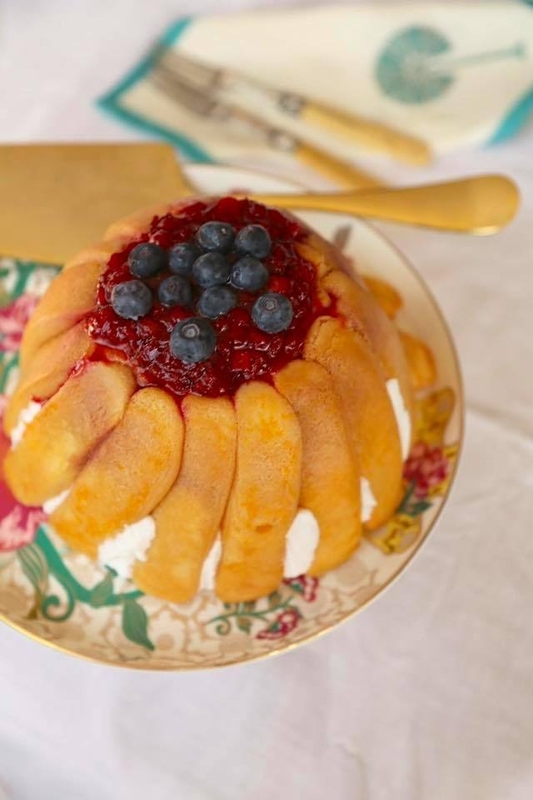 Charlotte Russe is a chilled, set dessert of Bavarian cream in a mold lined with ladyfingers. 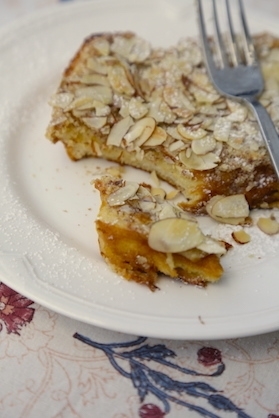 Ladyfingers are sometimes replaced with day old bread (apple Charlotte) or soft biscuits and sponge cake. Not as many have heard of this book but it changed the way Americans cooked. This book is a fore-runner to the world-famous 'Boston Cooking-School Cook Book' by Fannie Merritt Farmer, (the book that contained one of the earliest recipes for Brownies, the way they are made today). Charlotte Russe is a French dessert created by the legendary chef Marie-Antoine Carême named for his employers, George IV's only child, Princess Charlotte and Czar Alexander I. Russe is the French word for Russian. 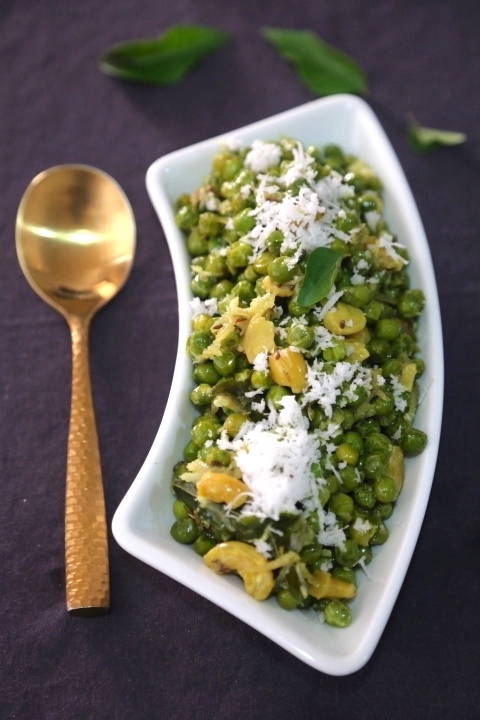 I use extra gelatine (if you are vegetarian use agar agar also called China grass)) to make this recipe because in India the climate is warm and cream splits easily. If you live in a cold climate and have access to high quality well homogenised cream use 15 grams of gelatin or 3 grams of agar agar. While agar agar is a good gelatine substitute it gives you a far less creamy result. Also agar agar needs to be soaked and then boiled before it is added to your Bavarian cream. Gelatin should be heated but never boiled. If you use eggless cookies or cake this dish contains no eggs. Line the inside of the pudding pan with plastic wrap leaving a large overhang of 3-4 inches outside the mold. Lightly brush the sides of each ladyfinger with sugar syrup using a pastry brush or drizzle with a spoon and line them one next to the other in the pudding basin to form a kind of rounded cone shape.The top of the Charlotte Russe can be a bit uneven because it will be garnished with more compote and fruit later. The syrup on the sides of the ladyfingers will help them stick together. Place another bowl inside the basin-this will help press the ladyfingers to the walls of the basin and prevent them from falling until the Bavarian cream is prepared. Add the gelatine to 3 tablespoons of cold water. Swirl the cup about a little bit but don't stir. Let sit 6-7 minutes. Add 1/2 cup warm water to the softened gelatin and return to a low flame. Swirl the pan about to dissolve the gelatine but do not boil it and avoid stirring it with a spoon. Let it cool for 5-6 minutes before you add it to the cream but begin work on the cream before the gelatine begins to set otherwise you will have lumps in your Bavarian cream. In a stand mixer or using an electric hand whisk whip the cream, sugar and vanilla on medium speed no more than 1 minute. Add the gelatine and whip again until cream begins to thicken to medium stiff peaks. Do not over beat as the cream will split, Gently stir in half the fruit puree and the kirsch using a spatula. Remove the smaller bowl from inside the pudding basin and slowly pour the thick, whipped fruit cream inside. Some of it will spill through the spaces between the cookies-you want this because once it sets it will hold the cookies upright. Smoothen the top of the cream. Lay the remaining 3 ladyfingers over the base. This will not be seen so you can also use any broken lady finger pieces here. Press the overhanging plastic over the dessert to ensure it is properly closed. Cover with a lid if the pudding basin has one otherwise use foil. Prepare a flat serving dish. Remove the mold from the fridge and open in the lid nor foil and gently open the plastic overhang. Tug gently a the sides of the plastic to loosen the Charlotte but do not pull the pudding out. Place the serving platter over the dish and turn the pudding basin over on the platter. Slowly remove the pudding basin and then gently peel away the plastic wrap. 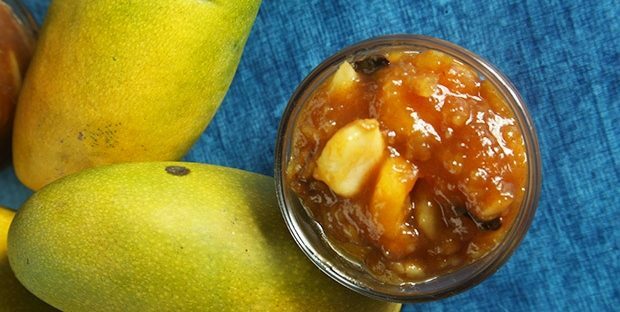 Top the pudding with some more compote and garnish with berries or cut fruit. Please consult your doctor about any health restrictions or allergies before enjoying this recipe. For the cake: Preheat oven to 400°. Butter a 9" springform pan and line bottom with buttered parchment. Whisk together egg yolks and sugar in a bowl until pale yellow. Gradually beat in flour until mixture is smooth. Add vanilla and set aside. Whisk egg whites in a medium bowl until stiff peaks form, then fold whites into yolk mixture, taking care not to deflate whites. Pour into pan and bake until brown, 25–30 minutes. Set aside to cool. 2. For the filling: Put raspberries, sugar, and 1 cup water into a medium saucepan. Simmer over medium heat until sugar dissolves and berries break down, about 10 minutes. Press through a sieve set over a bowl to catch purée. Return 2 cups purée to pan and set over low heat. Reserve remaining purée for sauce. Sprinkle gelatin in 1/4 cup cold water, set aside until softened, then add to purée in pan, stirring until dissolved, 1–2 minutes. Remove from heat, add eau-de-vie, and set aside to cool. Whip cream in a large bowl until soft peaks form. Gently fold cooled purée into cream. 3. Unmold cake and discard parchment. Slice cake in half crosswise, then return cake bottom to pan with ring reattached. Pour in filling, then replace cake top, brown side up. Cover with plastic; refrigerate for 24 hours. 4. For the sauce: Combine reserved berry purée, sugar, lemon juice, and eau-de-vie in a bowl and stir until sugar has dissolved. Slice cake and serve with sauce.